Luke Senter is our itinerant member. He currently lives in North Richland Hills but comes to Abilene whenever finances, parole and restraining orders permit. Luke has been playing the pipes since August of 2002. He has been with the Abilene Pipers since August of 2003. A couple of Punk bands such as The Dropkick Murphys and The Real McKenzies along with his Scottish heritage inspired him to play the pipes. 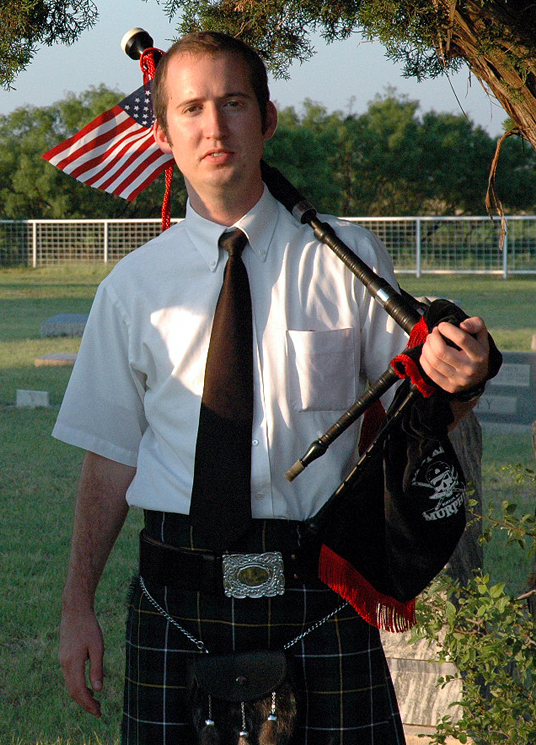 Luke has played at many events and functions throughout West Central Texas and is currently involved with the North Texas Caledonian Pipes and Drums. Their Webpage isn't nearly as good as ours but their playing is impeccable.